Plant Notes: Native to the Bahamas and Cuba (Acevedo-Rodríguez & Strong 2012), this species has a yellow corolla and is very similar to the white-flowered paleotropical species N. indica (Tippery et al. 2015). Because of its recent detection in Florida and the possibility of its cultivation (perhaps under a different name), N. grayana is tentatively considered non-native. 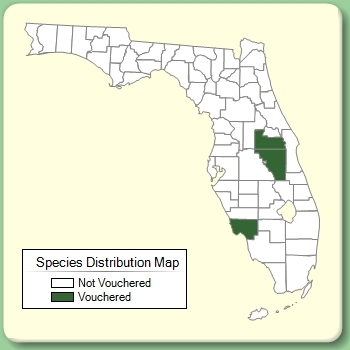 The species may have also arrived in Florida as a natural range expansion (Tippery et al. 2015). Citation NYMPHOIDES GRAYANA (Grisebach) Kuntze, Revis. Gen. Pl. 2: 429. 1891. Basionym: Limnanthemum grayanum Grisebach 1866. Type: CUBA: Los Reniales, 20 Dec 1860-1864, Wright 2933 (holotype: GOET; isotypes: BM, GH, MO, NY, P, S, US). Limnanthemum grayanum Limnanthemum grayanum Grisebach, Cat. Pl. Cub. 181. 1866. TYPE: CUBA: Los Reniales, 20 Dec 1860-1864, Wright 2933 (holotype: GOET; isotypes: BM, GH, MO, NY, P, S, US). Trachysperma grayanum Trachysperma grayanum (Grisebach) House, New York State Mus. Bull. 233-234: 66. 1921. BASIONYM: Limnanthemum grayanum Grisebach 1866. Limnanthemum aureum Limnanthemum aureum Britton, Bull. New York Bot. Gard. 4: 142. 1906. 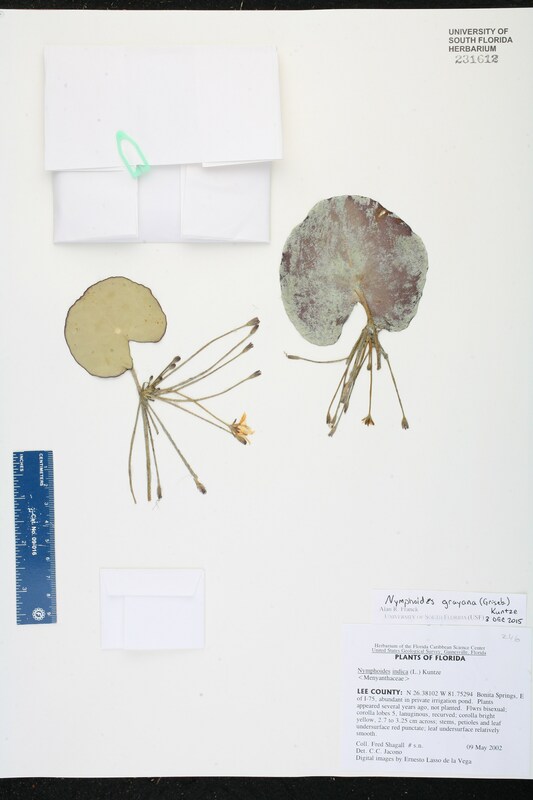 TYPE: BAHAMA ISLANDS: Great Exuma: Near Georgetown, 22 Feb 2905, Britton & Millspaugh 2974 (holotype: NY; isotypes: F, GH, US). Limnanthemum ekmanii Limnanthemum ekmanii Urban, Repert. Spec. Nov. Regni Veg. 20: 342. 1924. TYPE: CUBA: Isle of Pines: Near Santa Bárbara, Isla de la Juventud, 11 Mar 1920, Ekman 12075 (holotype: S; isotype: S). Nymphoides aurea Nymphoides aurea (Urban) Alain, Mem. Soc. Cub. Hist. nat. "Felipe Poey" 22: 116. 1955. BASIONYM: Limnanthemum aureum Urban 1924. Nymphoides aurea Nymphoides aurea (Britton) Britton, in Britton & Millspaugh, Bahama Fl. 333. 1920. BASIONYM: Limnanthemum aureum Britton 1906. USA Florida Lee Co. 09 May 2002 F. Shagall s.n.